For years, I wished for a good microscope to use in our homeschool. I dreamed of having one on a table in our school room always ready to explore. We would gather things to observe as we went about our day – leaves, lint, hair, insects, etc. The reality for us, though, was that a microscope was way out of our budget. We bought one at a yard sale, but it didn’t work very well. And, it was very big and clunky. So, we explored what we could when it worked and relied on hand lenses for the rest. Hand lenses/magnifying glasses are great, but they aren’t nearly as powerful as a microscope. You aren’t able to see the finest of details with a hand lens so we weren’t quite satisfied. Two years ago, I was finally able to make that dream come alive for my homeschool! We were studying biology, and I knew a microscope would make our lessons so much more fun. I found a great deal on a microscope that would suit our needs, and we had a blast exploring a multitude of objects that year! These notebooking pages are a great place for kids to record their observations when exploring with their microscope. Notebooking pages are perfect for copywork and handwriting practice, as well. Add these to your science notebook, or use them with your nature study findings. This pack contains 14 notebooking pages, a ‘label the microscope’ page (and answer key), and two coloring pages for your youngest scientists. « Noah Conference and Ark Encounter Flash Giveaway! We are studying Biology this year, so an introduction to the microscope is in order. Thanks for the notebooking pages and giveaway. I agree. We had to save up for our microscope for quite some time! 🙂 These pages are great. Thanks! Science is not my strength. I enjoy working and learning with my kids on this subject. We like to do everything hands on-nature walks, dissections, experiments. I have a hard time picking. My favorites are biology, chemistry and astronomy, but I think my kids love earth based science the most since they get dirtiest with it. I am terrified to teach Science of Social Studies and don’t even know where to start. And my son is in 3rd grade and I don’t even know for sure what he needs to learn. I enjoy teaching earth science. I enjoying learning with my children on almost any science topic. I enjoy earth science/biology type sciences more than physics/chemistry. I love ALL science! That has so far been the one thing that hasn’t gotten stale. So my answer is that my favorite science topic is science. =) Thank you for the opportunity! 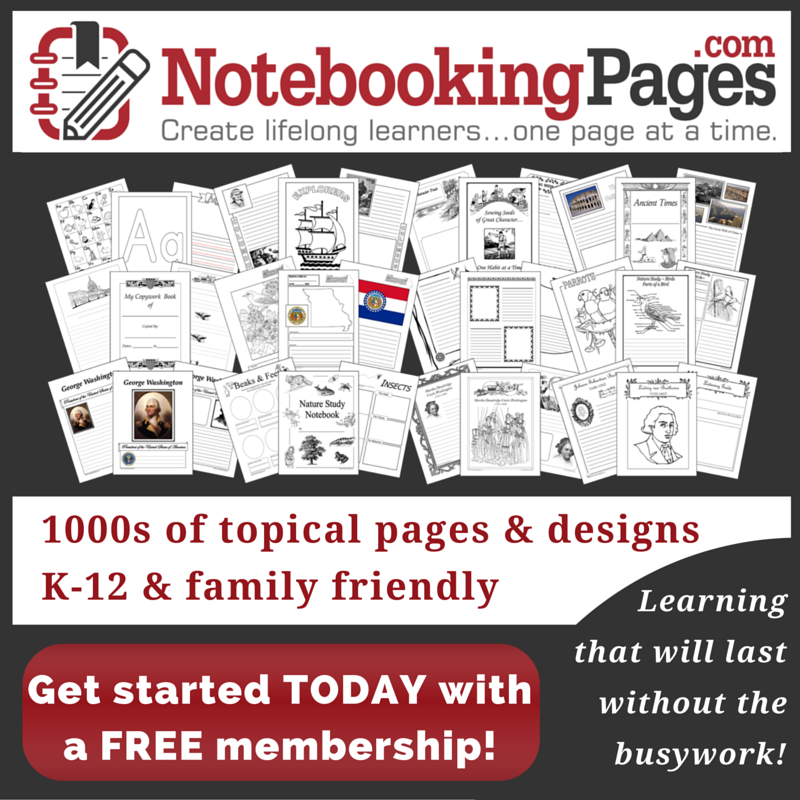 These notebooking pages are great espicially for new homeschool mom starting on our journey. We love looking at bugs under a magnifying glass, so the microscope will be next. Thanks for all your help getting started. My favorite subject would be Earth Science. Love being outside and seeing all of the things in nature! My favorite science topic to teach is Chemistry. My major in college for my undergraduate degree was chemistry. I love it! Neuroscience and the brain is my favorite science to teach! My favorites are probably biology and chemistry but I’m getting over my love/hate relationship with botany as well. Though, I didn’t enjou all the memorizing of Biology terms in college, I did enjoy Biology lab immensely. My sons 7 and 9 love when I teach them life science topics. Oh I would love to win this for our homeschool!! And all the prizes are great! I love to teach science, so it is hard to pick one! I would say biology or earth science would be at the top of the list though. I love rocks and minerals, science is not my strength at all. I love teaching any science that is hands-on! I love teaching about the Anatomy & Physiology. I enjoy teaching about Animals. My daughter loves topic studies on individual animals.